The cane is dismounted in 2 parts by unscrewing. The longest part is a brass tube sheathed of bamboo; it is the barrel. It comprises the end which one poses on the ground and which is used as extractor. At the other end, where threading is seen, it is the room which accepts a cartridge of 320. The other part is a tube, with a stopper side of pommel and a tapping with the other end to be screwed with the barrel. At the bottom of tapping, a flat bottom with the passage of the striker. The striker is the piston with 2 ranges on the photograph. 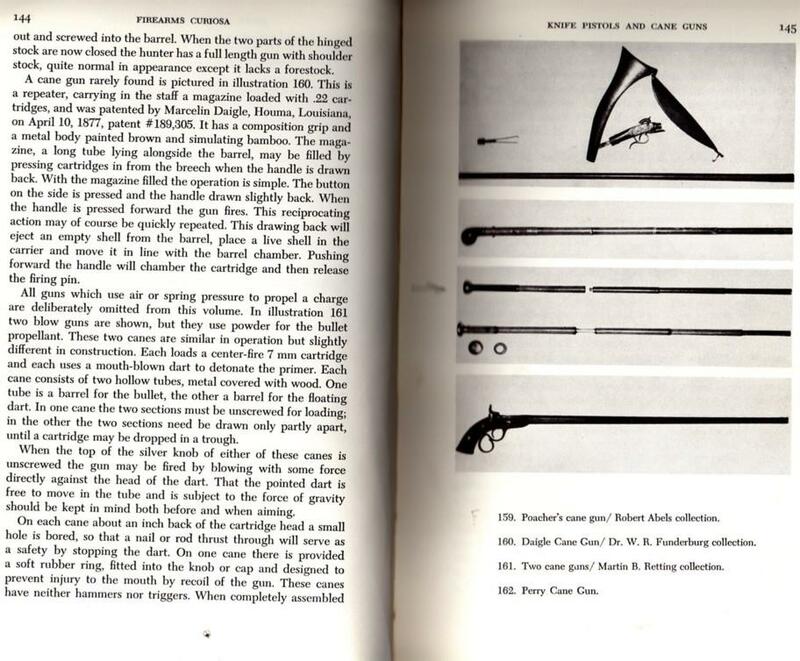 When you want to draw and that the weapon is charged; the end should be removed as another cane rifle, to remove the split stopper of the pommel, to raise the cane so that the striker comes in the pommel where it should be stopped with the inch. Then into blowing as in a blowpipe, the striker is projected ahead and comes to strike the cartridge. Notice the holes which are in front of the body of percussion: they are the vents so that the striker is not braked. I forgot; one should not forget to request God so that there is no rupture of base! If not the gases return you the striker; that you swallow, by losing 2 teeth with the passage! I think that it is also useful in walk mode to turn over the striker to avoid drawing a ball in the foot. I wonder whether this weapon had much success!!! In any case it is known until America. When I bought it, I thought that it was a proto of handyman; until the day when I found it in the book of Winant! Large surprise. The manufacturer will be hard to identify; because markings are rare.